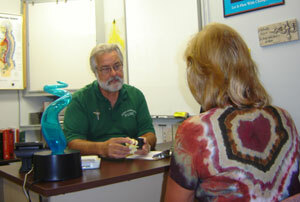 When you enter our health center, you will be greeted and welcomed by one of our professional Chiropractic Assistants. You will then be given a Case History to fill out. New practice members often remark how comfortable our practice is. Here at George’s Chiropractic Health Center it is our goal to offer state-of-the-art chiropractic care in a comfortable family friendly surrounding. After you have completed the Case History, you will view a short educational video to orient you on your chiropractic care. It explains how, through Chiropractic Care, you can regain your quality of life and what it is specifically a Chiropractor’s objective is. Even if you have been under Chiropractic care before, we are confident that you will find this video helpful in understanding about health through Chiropractic. One of our Lancaster Chiropractors will then review your case history, explain about the type of care we provide, as well as review our office procedures and policies to you. After the consultation, we will proceed with a spinal examination. This examination will include range of motion, weaknesses, pain, balance, weight distribution, pressure point testing and checking for misalignments of the spine. We will also do pressure point release for you to bring some relaxation in tight tissues and also increase blood flow to those areas. After the spinal examination, the chiropractor will review the findings with you and discuss the next steps to proceed with your chiropractic care as well as answering any questions that you may have.